Over the years, Amy Kurzweil came from suburban Boston to visit her mother's family in Metro Detroit. She became curious about her grandmother, Lily Fenster, who, at 13, escaped the Warsaw Ghetto during World War II and survived by posing as a Catholic orphan. While finishing college at Stanford in 2009, Kurzweil decided to explore what it meant to be Jewish, learn more about her grandmother's war experience and feel some of her grandma's pain. As a start, Kurzweil's mother, Sonya Kurzweil, a psychotherapist and graduate of the University of Michigan, gave her a transcript of the grandmother's oral history of her Holocaust experience, which was done for U of M.
Kurzweil then worked her artistic magic, albeit slowly. 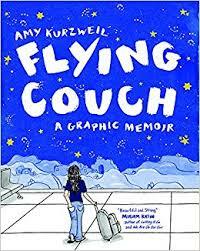 After eight years, Kurzweil -- now a 31-year-old Brooklynite -- produced a graphic memoir, "Flying Couch," a comic book of sorts that chronicles her coming-of-age through the story of her mother and grandmother she refers to as "Bubbe" -- Yiddish for grandmother. The book is featured as an editor's choice in The New York Times and earns glowing reviews. "Kurzweil beautifully balances humor with the history of her family’s tragedy," writes Freddie Moore for Lit Reactor. "'Flying Couch' is a wry and deeply moving exploration of what the Holocaust means to the descendants of survivors. Kurzweil artfully weaves her grandmother’s survivor testimony within her own coming of age story. Her obsession in understanding and immortalizing her Bubbe’s tragedy can be felt on every page." 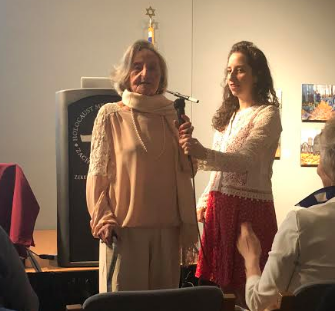 On Monday night, the three generations of women came together for a book signing at the Holocaust Memorial Center in Farmington Hills that included a talk by Kurzweil and her mother Sonya. Below is an interview with Kurzweil, who teaches writing and comics at the Fashion Institute of Technology in Manhattan. She's also published nearly a dozen cartoons in The New Yorker magazine. The second video is an amusing trailer promoting the book. It's a conversation between Kurzweil and her grandmother. The 288-page paperback is available here.